Cheetah c550 Platinum Edition speed camera detector provides advanced warnings to fixed and mobile speed cameras and red light cameras in the UK, Europe, USA, Canada, Australia and New Zealand all without paying a penny more for subscription. Unlimited lifetime speed camera subscription is included with the Cheetah c550 Platinum Edition when purchased from ActiveGPS. 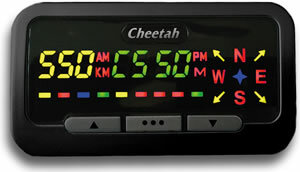 On approach to a speed or red light cameras location the Cheetah c550 Platinum Edition LED screen features your vehicles speed, a proximity bar countdowns to the cameras location and a distance in metres is displayed on screen, enabling you to see exactly how far you are away from the camera. In addition spoken voice alerts describe the location of the approaching speed camera e.g. "Attention, speed camera after the lights, limit 30". The Cheetah c550 Platinum Edition includes lifetime unlimited speed camera updates to all regions (UK/EU, USA/CAN and AUS/NZ) and also includes a 3 year guarantee. 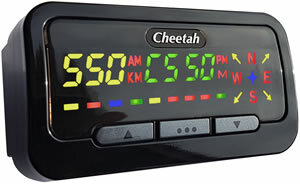 The Cheetah c550 Platinum Edition GPS based speed camera detector includes lifetime unlimited red light and speed camera location alerts in the United Kingdom, mainland Europe, United States of America, Canada, Australia and New Zealand. 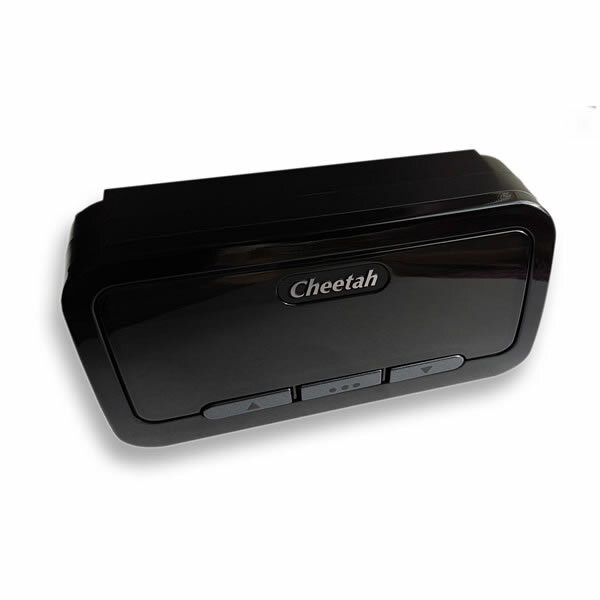 All of which are included in the price of the Cheetah c550 Platinum Edition - no additional subscription fees to pay. What's more the Platinum Edition warranty is extended to 3 years, from the standard 1 year which is included with the standard Cheetah c550. "Attention, red light speed camera, limit 30"
"Attention, speed camera on back of the overhead sign, limit 70"
"Attention, part-time red light camera on the dual carriageway, limit 70"
"Information alert, speed camera not this direction not enforced, limit 30"
In addition to the speed camera alerts you can hear, the Cheetah c550 also provides comprehensive on screen information via the units LED screen. On screen c550 information includes a proximity bar counting you down to the cameras location. 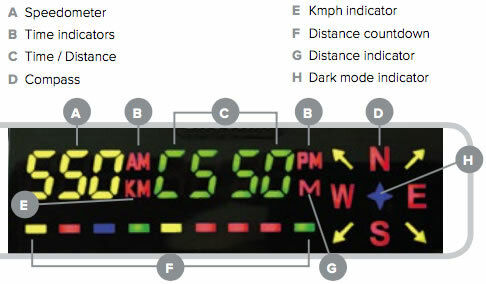 A distance in metres to the speed or red light cameras location in the road ahead. 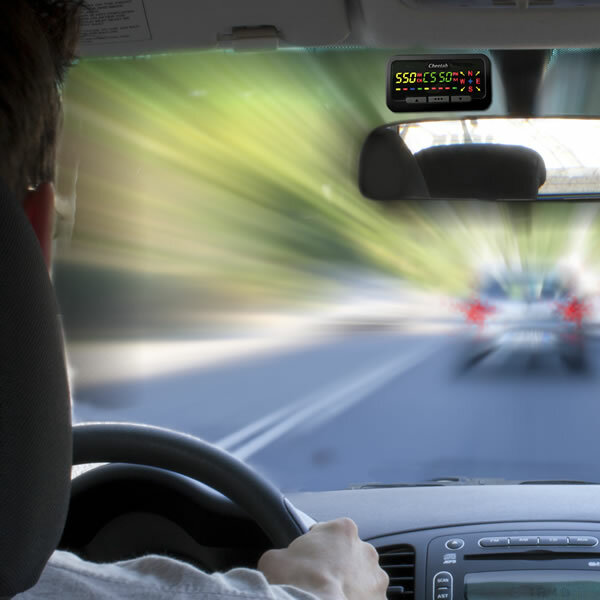 Your vehicles actual and current speed is also displayed, ensuring you have all the information you require before you reach the speed cameras location. The video below shows the Speed Cheetah c550 Platinum Edition on approach to various speed camera location with spoken voice alerts. The Cheetah c550 Platinum Edition Trinity 3.0 database doesn't just include speed camera locations but also many other camera types and hazards e.g. school zone alert, red light cameras, mobile speed camera locations, etc. Please see comprehensive list below of alerts types. The various alert types can be switched on or turned off completely as the end user chooses. 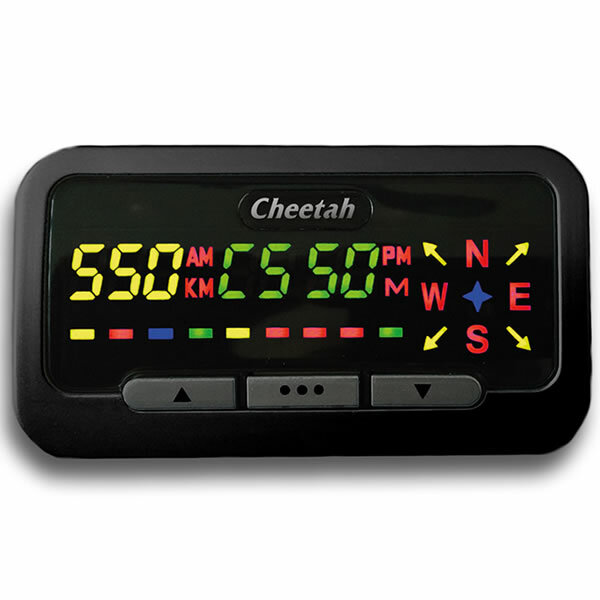 Please note: the Cheetah c550 Platinum Edition does not include a radar or laser detector. 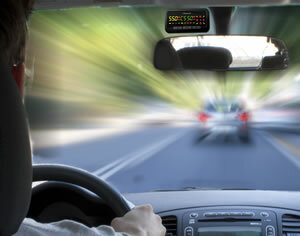 All speed camera alerts are via the GPS database only. You can also add up to 64 of your own preset locations to be warned of. This is useful when you want a countdown to particular locations. Simply set your pre-defined location(s) and the Cheetah will alert you to them. Do you have a question about the Cheetah c550 Platinum Edition that's not been answered on this webpage? Please see our speed camera detector FAQs for questions from other customers and visitors. Plus if the answer to your question isn't featured, use the online form to ask us for the answer. Alternatively please telephone 01733 777623 Monday to Friday (9:30am-5:00pm) to speak to one of our sales team. Everything you need to power and mount the Cheetah c550 Platinum Edition in your vehicle is included in the box when you buy the c550 from ActiveGPS. Included in the box are both a windscreen and dashboard mount. The windscreen mount uses suction cups to attach to your vehicles windscreen. The dashboard mount is magnetic with a adhesive pad to attach to your vehicles dashboard. To power the Cheetah c550 Platinum Edition in-car a plug-in cigarette vehicle power cable is included. Additional genuine Cheetah c550 Platinum Edition accessories are also available to buy from ActiveGPS, either as replacements for the above or to enable a hardwire/bespoke installation. 1. The hardwire power cable (pictured right) enables you to power the Cheetah c550 Platinum Edition from your vehicles electrical supply. This option would free up your vehicles cigarette lighter socket and may also reduce or remove any trailing cables across your vehicles dashboard. The hardwire cable can be located behind your vehicles dashboard console. 2. The external GPS antenna (pictured right) enables you to use the Cheetah c550 Platinum Edition unit/screen in vehicles where the windscreen impedes or blocks a successful GPS signal or where you would like to mount the c550 in a different location to the windscreen or dashboard. For example you may like to position the Cheetah c550 Platinum Edition down near your vehicles stereo on your centre console. 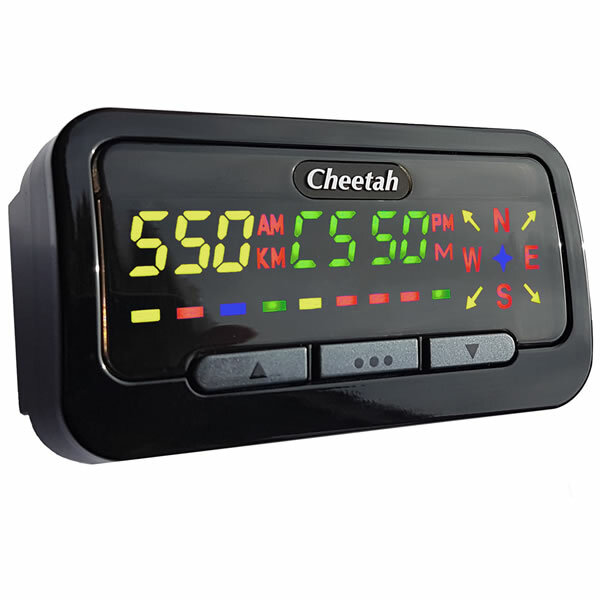 The Cheetah c550 Platinum Edition requires a live and constant connection to the orbiting GPS satellites in the sky above. By buying the external GPS antenna you can plug into the back of the Cheetah c550 Platinum Edition speed camera detector and position the GPS antenna (which has 5 metres of cabling) elsewhere in your vehicle to enable a successful satellite fix. The Cheetah c550 Platinum Edition includes lifetime speed camera updates/subscription for all regions - Region ONE, TWO and THREE - please see below for coverage. There is nothing further to pay to subscribe to the Trinity 3.0 database when purchasing the Cheetah c550 Platinum Edition from ActiveGPS. IMPORTANT: It is fully legal to use, own and operate a speed camera detector in the UK. However, before using the Speed Cheetah c550 Platinum Edition outside of the United Kingdom we STRONGLY RECOMMEND that you check to ensure that the use of a speed camera detector in other countries is also legal. The Trinity 3.0 database can be updated using a PC computer running Windows Vista, XP, 7, 8 or 10. An internet connection is also required. You can get access to the latest speed cameras as often as you like and if you forget you will be reminded if you do not update within a 6 week time frame. Please note: The Cheetah c550 Platinum Edition is not compatible Apple Macintosh operating systems. Do you have a question about the Cheetah c550 Platinum Edition? Submit your question via our contact page.